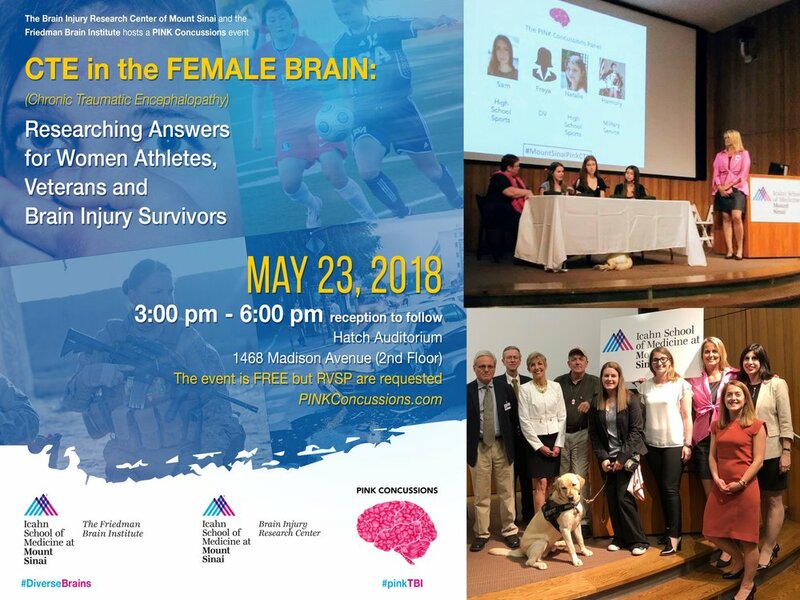 On May 23, 2018, the first event to focus on CTE in the Female Brain was held by PINK Concussions and hosted by the Brain Injury Research Center of Mount Sinai and the Friedman Brain Institute in New York City. Since the start of PINK Concussions in 2015, Katherine has been asking questions to top researchers about CTE in Women. Katherine has blogged on the lack of women in CTE research and explored the only two published cases of CTE in women in peer-reviewed journals. In all five previous PINK Concussions summits, there has always been a discussion of the importance to study women for CTE. However, as we believe it is so essential for women to be included in current and future CTE research is we felt it was important to feature this topic in its own event. We want to make sure women with a history of domestic violence, and thus of multiple sub-concussive blows are included in research. Here is a link to an article on the event: https://www.everydayhealth.com/neurology/first-ever-conference-on-cte-women-held-new-york-city/. “On May 23, 2018, more than 150 men and women gathered in an auditorium at the Icahn School of Medicine at Mount Sinai in New York City, to discuss a topic that is usually reserved for football players — chronic traumatic encephalopathy (CTE). But this time the focus was on if and how it affects the female brain. Because this was the first time this topic was held as a event, we had no idea the response we would have or if anyone would come? Our goal was to have 50-60 participants at this free event at a very busy time in May in NYC. With only email lists from PINK and Mount Sinai and social medical marketing, within three weeks, we had 179 RSVPS plus 25 walk-ins. The event was a great success and we look forward to our second CTE in Women Summit in 2019.